MINISTER FOR HEALTH Simon Harris has said that he made the decision to continue with the development of the new national children’s hospital despite the spiralling costs because “it’s so badly needed”. 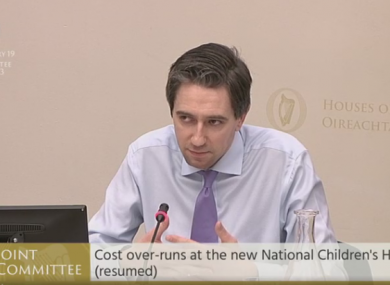 Harris made his comments in front of the Health Committee on the cost overruns at the National Children’s Hospital. He told the committee that when the overrun cost became apparent to him “it would be an understatement” to say that he was “very concerned”. Earlier this month, the committee was told the current estimation is the hospital will cost €1.433 billion – €450 million higher than the figure of €983 million approved by government in 2017. Harris told the committee today that he became aware for the first time on 21 August that there was going to be an overrun of costs and that he didn’t become aware of the final figure until early November. Last week, Taoiseach Leo Varadkar said the Department of Health has retained PWC, the expert accountancy and consultancy firm, to carry out an analysis of the situation. It is understood the review is expected to be completed in March. Fianna Fáil TD Stephen Donnelly today quizzed Harris on the project and said that “it is an understatement to say the public and healthcare professionals are furious” at the spiralling cost. Responding to Donnelly, Harris admitted that “it’s a very, very significant amount of money”. Explaining why he decided to continue to give the project the go-ahead despite the spiralling costs, Harris said that “when you’re minister, you’re presented with options” and that he had three options – to pause the project, to retender the project, or to continue with the project. “I had three options … First option was pause the project, I’m not pausing the building of the National Children’s Hospital. It’s been paused far too many times,” Harris said. “Second option was retender the project … all of the expert evidence was retendering the project would have cost more for the taxpayer … and would have increased the length of time it would take to deliver this project,” he said. “The third was to proceed and that’s the decision I took. It was one of the hardest decisions that the government has made in my time in government, certainly the hardest decision I’ve asked the government to make,” Harris said. “We couldn’t actually stop the project because it’s so badly needed in terms of the infrastructure for our children,” he said. Later in the committee, Harris added: “I’m not going to entertain any talk of pausing the project. Yes, it’s expensive … but we need to get this project now done. Last week, Donnelly questioned officials over the project, stating that the finished cost per bed at the new children’s hospital would be twice that of the most expensive hospital built in the world. He again returned to the issue of the bed costs today, saying that there are no extra beds or theatres planned despite the hospital costing more than initially anticipated. “Your point about beds is one that somewhat frustrates me when I hear it because it is ignoring the reality, it’s trying to suggest that there are no additional benefits to the new hospital other than maybe a nice building,” Harris said. Donnelly hit back at Harris over this, and said “no it’s not, at all”. Harris said: “There’s sick kids today in Crumlin, Temple Street, Tallaght, with their parents sleeping on the floor. Harris noted that the number of beds for the hospital were designed with paediatricians. Email “'It's so badly needed': Harris defends development of children's hospital despite rising costs”. Feedback on “'It's so badly needed': Harris defends development of children's hospital despite rising costs”.